What is a Buyer's Realtor®? A buyer's Realtor® works exclusively for the buyer. A buyer's Realtor® can help you properly assess the market value of a house, suggest necessary repairs or improvements, help negotiate a good price, follow through with contract contingencies, coordinate showings on multiple homes, and even help share intimate knowledge of different areas or home types and styles. More importantly, a buyer's Realtor® can help you assess the current real estate market in hyperlocal neighborhoods and provide you with information so you can make informed decisions. A buyer's agent is obligated to help the buyer get the best deal, contingencies, and terms. In contrast, a seller's Realtor® is legally obligated to get the best terms and price for the seller, not the buyer. Your payment is determined by several things. First, negotiate the best terms through your buyer's Realtor®. Then subtract the down payment. The more you put down, the lower your loan amount…and sometimes the lower your interest rate will be. In most cases, your property taxes and homewoner's insurance will also be included in your payment. Next, calculate your payment based on the loan amount using our loan calculator. You’ll need a guestimated interest rate to plug in to the calculator. Finally, you’ll need to add up all your monthly recurring lines of credit and divide that by your gross monthly income. The ratios change all the time, but if you have an idea what your ratio is it makes it easier to find a good lender. BEWARE: Mortgage lenders and loan officers are infamous for ‘bait and switch’ tactics, promising you one thing only to give you something else at the closing table. Get everything in writing. We can help you understand the complexity of loan approvals. 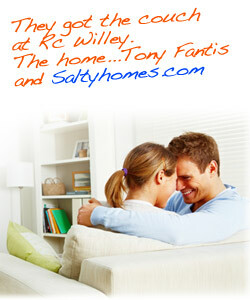 Get a preferred lender referral from a Saltyhomes.com selected Realtor®. The amount will vary on a number of factors including your income and the type of loan you get. There are other factors, too. Generally, you need to have at least 2.5% down and another 2-3% to pay for closing costs. We can sometimes negotiate with the seller to get your closing costs paid. The other money must come from you or an approved source. In rare cases, you may be able to borrow the entire amount. I want to save my favorites. Do I have to register? Yes and no. At saltyhomes.com you are never required to login to search all the Utah homes for sale. If you want us to save your favorites, you’ll need to create a simple account so we know which houses to save for which person. You’ll be able to access your favorite homes or condos from any computer, anywhere, any time. Do you have a Utah real estate question about selling or buying? Click here to contact Tony. Click here to search all Utah homes for sale.